Having an "old fashioned" winter this year brings to mind ice harvesting! Youngsters today probably don't know what an icebox is! Many who grew up with them called their new electric refrigerators "iceboxes". How often do we think about how difficult it must have been just to preserve food a hundred years ago? Some families had root cellars while others had spring houses. Until about 1800 Americans were content to cool their food and drink in this manner. From about 1800 until 1920 nearly every community of any size in the northeastern United States had its local ice harvesters since people wanted something better than dried or salted meats, and that included Berlin. Initially, axes were used to chop ice from ponds and later the ice saw was used. Experienced ice harvesters preferred small, deep lakes away from towns where the water was pure. The clearer the ice, the denser the cakes and thus more lasting. Ice formed on top of mountains is said to be the hardest and the slowest to melt. Thus, Kendall Pond, Dyken Pond, and the reservoir were ideal places for good ice. I am told that ice was also harvested from the pond on the Bentley Farm. That pond, which was approximately in front of the home of Stanton Goodermote, no longer exists. The thickness of the ice at Kendall and Dyken Ponds was given in the weekly newspaper, and was reportedly of a "fine quality" or "clear as crystal". One such newspaper entry in February, 1909, stated that "most of the ice houses about the village were filled last week. Some with the 15-inch lake ice, so clear that you could tell the date on a half dollar through it." Mike Oswalt and Walt Nichols drew ice and A. J. Goodermote kept his men busy in the winter drawing ice from Kendall Pond and the reservoir. He once lost a team of horses through the ice at Kendall Pond, but managed to get them out. Imagine the job that was! Gib Yerton, one of A. J. 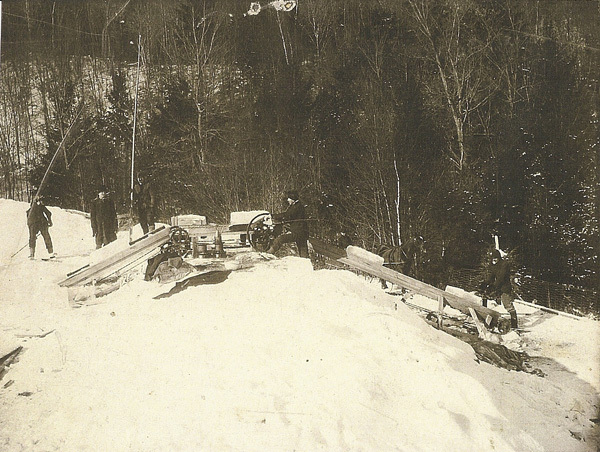 's men, built a cutter with saws and a ramp to the sleigh to haul the ice more easily. The harvesters eagerly awaited the date when the ice could support a team of horses. After the holes were bored in the ice and measuring rods inserted to check the thickness, the harvester removed the snow from the ice. The harvester usually sought ice that was 14 to 16 inches thick, but some years had to settle for it being only 8 to 12 inches thick. The harvesting of ice was usually done in a few weeks, and the men had to work rapidly because the supply depended solely on the climatic conditions. In Berlin, most harvesting was done sometime in late January through February, depending on the weather. In March of 1900, the Water Supply Company, under the direction of Tracy D. Taylor, had cut and furnished nearly all the fine twelve-inch ice stored in the village and vicinity. The reservoir had been enlarged the previous year enabling the harvesting of all the pure spring water ice that was needed. Several farmers had ice houses as did the engine house of the railroad. There was an ice house at Wyckoff's (across the road from the home of Ed and June Schindler), and one at the home of Dave Sicko used by Mr. Whitney for the Ranch Tavern. Manchester's Market, Stillman Brothers Store, and the condensary also had ice houses. There was also a small one on the corner of Main and Elm Streets on the site of the shirt factory which was used by J. Wilcox (a soda maker). Different reasons for building ice houses were given: better quality meat, cooler milk, sweet butter, and the preservation of food as well as the slaughtering of animals in warm weather without the fear of spoilage. For an average farm family, an ice house 10 by 10 feet was adequate. Ice houses were located in areas divested of trees, and exposed to a free circulation of air. When possible, the ice houses were painted white to help reflect the sun so the ice didn't melt as fast. It was the usual custom to have a layer of sand about 10 inches deep on the bottom of the ice house, covered with a layer of straw. And, of course, there had to be a drain in the bottom to carry off the watere. The floor was made of three to six-inch planks, high enough from the ground to allow free circulation of air and slanting enough to drain the water. The cost of building an ice house in 1840 was about $20; by 1870 the cost had gone up to $150. As ice was brought into the ice house, many farmers threw a layer of sawdust on top of each row of cakes for insulation. When ready to use the ice, the sawdust would have to be washed off thoroughly. I'll take my frost-free refrigerator, thank you very much!